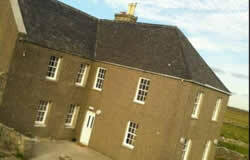 Nunton House Hostel is located on Benbecula; in the centre of the Uists. It's an ideal location for all, within easy reach for walks, wildlife, beachcombing, and hill climbing. It's easily accessible; on the main bus route through the islands and just over a 1 mile from Balivanich the main village in the Southern Isles, which is home to the airport, shops, post office, bank, restaurant and pub. Nunton House Hostel is recently refurbished and is set within part of the former 18th century home of the Clan Chief of the Clan Ranald ; where Bonnie Prince Charlie got dressed a Betty Burke; Flora MacDonald’s maid before escaping over the sea to Skye. We offer a basic self service continental breakfast with tea & coffee included in the tariff. We also offer laundry facilities, towel hire, internet access PC and free Wifi, cycle storage and ample parking space. We aim to provide good quality affordable accommodation to individuals, couples, groups* and families.